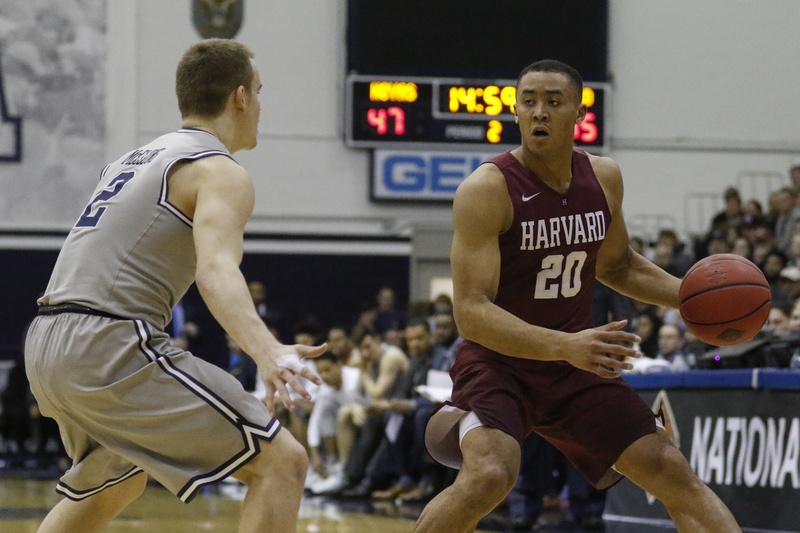 Sunday night will mark a week from Harvard men’s basketball’s disappointing loss in the Ivy League Championship against Yale. Yet, while the Bulldogs’ season has since concluded after a first-round loss against LSU in the first round of the NCAA Tournament, the Crimson’s 2018-2019 campaign lives on as Harvard will travel to North Carolina for the second time this season. The Crimson will take on NC State in a sold-out Reynolds Coliseum, four days after knocking off the Georgetown Hoyas in the first round of the NIT. The contest will tip off at 7:30 PM, and will be nationally televised on ESPNU. If Harvard could win yet again on the road, over the 11-point favorite Wolfpack, the Crimson would advance to within a game of the semifinal round, which will be hosted at New York’s Madison Square Garden. In order to do so, however, will require another strong effort from Harvard in a hostile environment. The Crimson remained unflinching despite a raucous crowd of Georgetown faithful at McDonough Arena on Wednesday night, as the Hoyas’ supporters came in droves to see the first Georgetown game in several years played on campus. A late Hoyas’ run left Harvard with its backs against the wall, fighting for its season and the careers of its six seniors, but the Crimson were able to find a late surge to hold on for a three-point victory in Washington, D.C. Knocking off NC State — another basketball blue blood— will be no small feat for the Crimson. The Wolfpack, who narrowly missed out on an at-large bid to the Big Dance, are lead by a trio of high-percentage shooting guards. Torin Dorn, Markell Johnson, and C.J. Bryce helm NC State’s offense, all of whom average double-digit scoring per game, and shoot the ball at over a 45 percent clip from the field. Dorn, a redshirt senior, leads the team in scoring and rebounding, at 13.5 and 7.1 per game, respectively. The Charlotte, NC., native had an impressive outing in the first round of the NIT against Hofstra, scoring 19 points and chipping in nine rebounds in a come from behind victory at Reynolds. NC State also boasts an impressive frontcourt, helmed by forward DJ Funderbunk. The sophomore will be an apt match for Harvard’s Chris Lewis, as both tower above the court at 6’10 and 6’9, and the duo also share the No. 0 jersey. Funderbunk, a native of Cleveland, OH., has averaged just over 20 minutes per game, scoring 8.9 points per game on an efficient 55 percent field goal mark. Up against an evenly sized opponent, Lewis will be relied upon in Raleigh, both offensively and defensively. The junior forward had a solid game against the Hoyas, going up against talented big man Jesse Govan. The Alpharetta, Ga., native scored 10 points for the Crimson, chipping in six rebounds in 21 minutes of play, a welcome performance after Lewis’ two-point disappointment against Yale in the Ancient Eight finals. Ultimately, it’s hard to believe Harvard’s success won’t live and die by the performance of junior guard Bryce Aiken. A game after scoring 38 points against Yale, Aiken’s late scoring, knocking in the Crimson’s final six points, lifted the visitors over Georgetown. The Randolph, N.J., native, despite scoring a modest 17 points, asserted control in the first round when Harvard needed it most, and will be relied upon similarly on Sunday night. Now averaging over 22 points per game, Aiken’s 86 percent clip from the free-throw stripe has become an integral part of the Crimson’s success, never more apparent than on Wednesday, when he drilled 4-of-4 free throws in the final minute to knock off the Hoyas. Aiken will certainly be a focus of NC State’s Head Coach, Kevin Keatts. Keatts, who is in his second season at the helm of the Wolfpack program, has not missed an NCAA Tournament since the 2014-2015 season. Keatts led UNCW to two Tournament appearances, and NC State to the Big Dance in his first season last year, but will look to keep his team focused on advancing to within a game of Madison Square Garden. A sold-out Reynolds Coliseum and home court advantage make the Wolfpack the clear favorites on Sunday night. That being said, Harvard Coach Tommy Amaker will certainly have his team prepared, after a gutsy victory over Georgetown, arguably the team’s most impressive win of the season. Instead of hanging their heads at losing for a second straight season in the Ivy Championship, the Crimson seem poised to continue to compete in the NIT, looking to upset a team on the road for the second time this week, and advance to within a game of playing at MSG, dubbed the World’s Most Famous Arena. — Staff writer Amir Mamdani can be reached at amir.mamdani@thecrimson.com. Follow him on Twitter @AMamdaniTHC.